J.J. Barnes came up with the idea for Lilly Prospero And The Magic Rabbit in her mid twenties. It took years of experimentation and learning, becoming a mother, and then divorcing her husband before the book was completed. It was inspired by her own feelings of not fitting in during her teens, and her pet rabbit Jeffrey who sadly died during her pregnancy with her daughter, Rose. Growing up, J.J loved stories about magical people and the worlds they lived in. She was, of course, part of the Harry Potter generation, but also loved TV shows such as Buffy The Vampire Slayer, Charmed and Heroes. Writing strong, diverse female characters was always and important thing for J.J. The world is dominated by male leads in stories having adventures and saving the world. Indeed, in YA fiction when girls are in the lead roles, so often they are motivated by the desire to fall in love. Whilst writing a love story for Lilly and Saffron isn’t outside the realms of possibility, J.J is keen to establish the girls have motivation and desires for themselves that extend far beyond the interest of boys. When boys are involved, which is seen with characters such as Alex and Hogarth, they will motivate and interest them in different ways, but there is far more going on than just the desire for their interest. 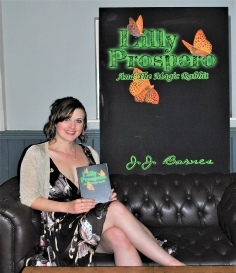 J.J plans on exploring the world of Lilly Prospero in further books, as well as hoping to have cross over elements with The Schildmaids Saga.